Ideal for the whole family – adults, children and wheelchair users. Can be used for a multitude of activities in the kitchen, like computer work or art as well as food preparation. Two height ranges of 300 mm (550 – 850 and 650 – 950 mm). Adjust the height simply by the push of a button or by using a winding handle or remote control. The frame is made to the size of any kitchen benchtop or dining tabletop – up to 3000 x 1200 mm. Sinks and cooktops can be integrated in the benchtop. 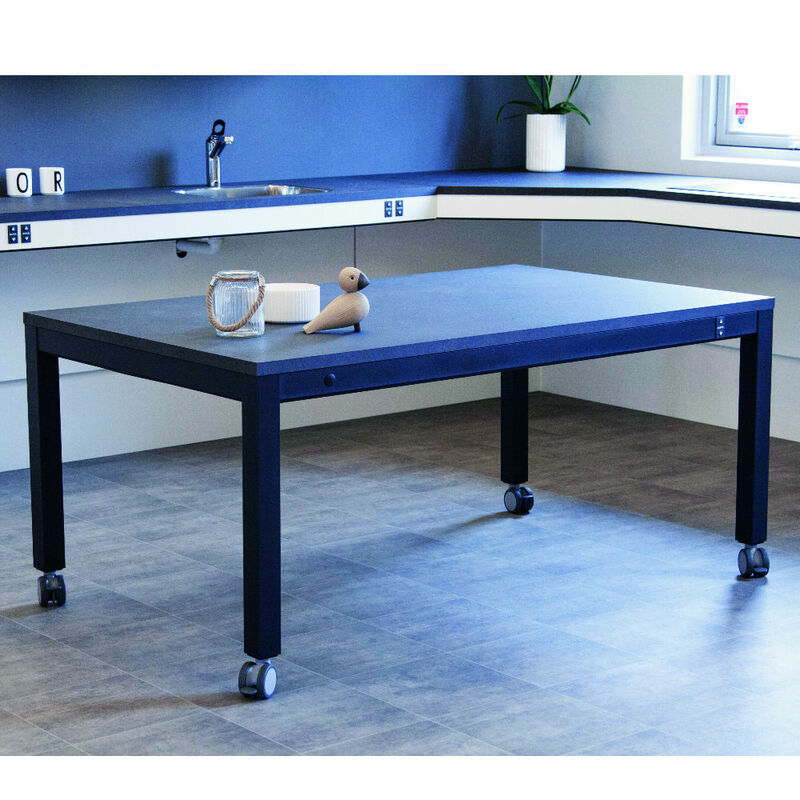 Optional brake castors make it easy to move the table, but standard adjustable feet or hidden floor fixings can be used. A rechargeable battery solution means the electric version is easily mobile. Fully charged batteries can last up to 3 months. Please note this is a Custom Configured Item. To suit individual needs, this item may require multiple additional extras, delivery and fitting costs that are not included in the published price. Please contact Novitatech for a detailed quote. Clinical Assessment by an Occupational Therapist is recommended before purchasing. The product is warranted for quality manufacture and construction for 24 months after installation. (Limited lifetime).